Cycling is a sport that can be conducted at either your own pace, or at a set distance which challenges your aerobic endurance further. If you cycle for between 45-60 minutes in a session, this will require moderate intensity over a modest duration, depending on your speed and location. Professional cyclers engage in far more intense cycling over longer periods, which can result in your blood sugars falling without careful management. Javier Mejías was diagnosed with type 1 diabetes when he was 15, but now rides for Team Novo Nordisk, the first all-diabetic professional cycling team, along with Joe Eldridge and Andrea Peron, among others. Team Novo Nordisk has confirmed four new riders will be joining the professional team in 2015, possessing an 18-rider roster for new season. The more you cycle, and the more energy you expend, will result in your blood sugars falling faster. You need to keep your energy levels high so consuming small amounts of sugar at frequent intervals will be advised. If you are cycling for a short time, say between 20-30 minutes, then sipping a sugar drink halfway through your ride should be sufficient. Longer rides, however, will require frequent blood testing. One test 20 minutes into your ride will enable you to gauge the trend of your blood sugar. If you are new to cycling this should then be conducted every 30 minutes onwards. Six hours after the ride, your body will draw on glycogen to refuel the muscles during the ride and this can subsequently lead to a hypoglycemic attack. Carefully assessing your blood sugar regularly after your ride will help you spot if a hypo is looming. Having a regular fuel strategy and routine will enable to find out how your body reacts to exercise levels each day and how you should alter your insulin prior to cycling. Knowing how to count carbohydrates will assist in building a regular schedule, which may require some experimentation to assess what works best for you. Team Novo Nordisk cyclist Stephen Clancy, who has type 1 diabetes, told Diabetes.co.uk “I don’t have one set medication routine that I stick to because every day changes slightly. Everyone is different and no two days are exactly the same, which influences how I manage my diabetes. Carrying substantial fuel with you to last the duration of the trip is also necessary, as well as a suitable supply of insulin in case you measure any highs when testing your blood. You should check your blood sugar levels, as previously mentioned, but regular cyclists in a good routine that race for five to seven hours on certain days could extend checking to every 90 minutes. Recognising signs of low or high blood sugar will also prove proactive. If you cannot recognise hypo signs, you risk not being able to act quickly enough to prevent your blood sugar dropping further while cycling. If you have any doubts about the stability of your blood sugar you should test immediately. Low blood sugars will require you to stop riding immediately, which is why obtaining a stable routine as soon as possible is beneficial so you can concentrate on your cycling. Experienced cyclists may have discovered that testing blood on the move can be dangerous if you don’t stop. However, some cyclists with diabetes, especially triathletes, have been known to tape their testing kits to the handlebars of their bikes to allow for quicker testing, which may be useful for long distance cycling. This method should not be considered by anyone who isn’t an extremely competent cyclist as it presents a great risk of injury. Using a continuous glucose monitor (CGM), meanwhile, can allow you to keep an eye on your levels in real time and consume more sugar as needed. Falling down is a risk for your insulin pump while cycling, but if positioned in a place of the body such as the arm, where the tubing won’t get snagged, then wearing your pump should otherwise be fine when cycling. 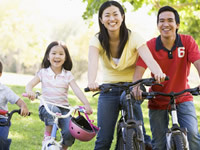 What does the community think about cycling with diabetes?